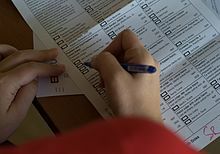 The 2008 United States presidential election in Texas took place on November 4, 2008, and was part of the 2008 United States presidential election. Voters chose 34 representatives, or electors to the Electoral College, who voted for president and vice president. Texas was won by Republican nominee John McCain by an 11.8% margin of victory despite "failing to deliver written certification of their nominations" on time to appear on the ballot. Barack Obama, the Democratic Party nominee and eventual President of the United States, made a similar error. Prior to the election, all 17 news organizations considered this a state McCain would win, or otherwise considered as a safe red state. This is because although the state is very diverse and has a huge Latino population, Latinos in Texas - despite being fairly Democratic - make up only 20% of the electorate. 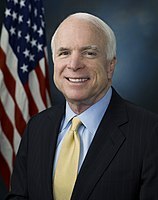 Polling throughout the state showed Republican John McCain consistently and substantially leading Democrat Barack Obama. On Election Day, McCain won the state, although his margin was less than native son George W. Bush in 2000 and 2004. This was the first election since 1996 in which the margin of victory was less than 1 million votes. With its 34 electoral votes, Texas was the largest prize for McCain in 2008. As of the 2016 presidential election[update], this is the last time the Democratic candidate won Brewster County. McCain won every single pre-election poll. The final 3 polls averaged McCain leading 52% to 41%. Obama raised $20,424,500. McCain raised $17,990,153. Obama and his interest groups spent $9,917,565. McCain and his interest groups spent $33,983. Both campaigns visited the state twice. Texas, split between the south and southwest regions, has become a consistently Republican state at all levels and is the home state of then President George W. Bush. Economically and racially diverse, Texas includes a huge swath of the Bible Belt where many voters, especially those in rural Texas, identify as born-again or evangelical Christians and therefore tend to vote Republican due to the party's opposition to abortion and gay marriage. Although once part of the Solid South, the last time Texas voted for a Democratic presidential nominee was Jimmy Carter in 1976. McCain did well throughout the state, winning the vast majority of counties by double digits. He took practically every county in Eastern Texas - large regions of which once voted Democratic. All the suburbs of the major cities voted Republican by large margins. He also dominated the Texas Panhandle (including Amarillo), the Permian Basin (including Midland and Odessa) and the South Plains (including Lubbock), three of the most conservative regions in the country. He won these three regions by margins of three-to-one—his largest margin of victory in the entire country. These areas had been among the first in Texas where the old-line conservative Democrats started splitting their tickets and voting Republican nationally; some counties in this region haven't supported a Democrat since Harry Truman in 1948. King County, a thinly populated county in the Panhandle, gave McCain 92.64% of the vote to Obama's 4.91%--McCain's biggest margin in any county in the nation. Obama, however, did win major urban counties such as Dallas, Bexar and Harris counties—home to the cities of Dallas, San Antonio, and Houston respectively. Dallas and Harris had been among the first areas of the state to turn Republican, largely due to an influx of Northern expatriates in the 1940s and 1950s. Neither county had supported a Democrat for president since 1964. Bexar had last gone Democratic in 1996. Liberal whites and Hispanic voters in Dallas combined with heavy turnout of African Americans in Houston, and Hispanic turnout in San Antonio helped give Obama the edge and carry these three counties. Obama also performed strongly in Travis County, which contains the state capital of Austin. Obama also carried El Paso County, which contains the city of El Paso, due in large part to heavy support by Hispanics. Obama also carried many of the Latino-majority counties in the Rio Grande Valley along the border with Mexico, which have strongly supported Democrats for decades. Although Obama lost the rural Tarrant county, he did well in the southern and eastern parts of Fort Worth and the eastern part of Arlington. During the same election, incumbent Republican U.S. Senator John Cornyn was reelected with 54.82 percent and defeated Democrat Rick Noriega who took in 42.84 percent. Libertarian Yvonne Adams Schick received the remaining 2.34 percent. Republicans also knocked off a Democratic incumbent from Texas in the U.S. House of Representatives. At the state level, however, Democrats picked up three seats in the Texas House of Representatives and one seat in the Texas Senate. Obama improved on Kerry's performance in Texas by 5%. John McCain carried 21 of the state's 32 congressional districts, including one district held by a Democrat. ^ "Bob Barr sues to remove Obama, McCain from Texas ballot". 2008-09-16. Retrieved 2016-09-22. ^ "D.C.'s Political Report: The complete source for campaign summaries". www.dcpoliticalreport.com. Retrieved 2016-09-22. ^ "Electoral-vote.com: President, Senate, House Updated Daily". electoral-vote.com. Retrieved 2016-09-22. ^ "POLITICO's 2008 Swing State Map - POLITICO.com". www.politico.com. Retrieved 2016-09-22. ^ "RealClearPolitics Electoral College". RealClearPolitics. ^ "CQ Presidential Election Maps, 2008". CQ Politics. Archived from the original on June 14, 2009. Retrieved December 20, 2009. ^ "October – 2008 – CNN Political Ticker - CNN.com Blogs". CNN. October 31, 2008. Retrieved May 26, 2010. ^ "roadto270". hosted.ap.org. Retrieved 2016-09-22. ^ "Election 2008: Electoral College Update - Rasmussen Reports™". www.rasmussenreports.com. Retrieved 2016-09-22. ^ "Election 2008 Polls". Dave Leip's Atlas of U.S. Presidential Elections. ^ Silver, Nate. "Messing With Texas". FiveThirtyEight. Retrieved 2009-05-17. ^ Leip, David. "Presidential General Election Map Comparison: Texas". Atlas of U.S. Presidential Elections. Retrieved 2009-05-19. 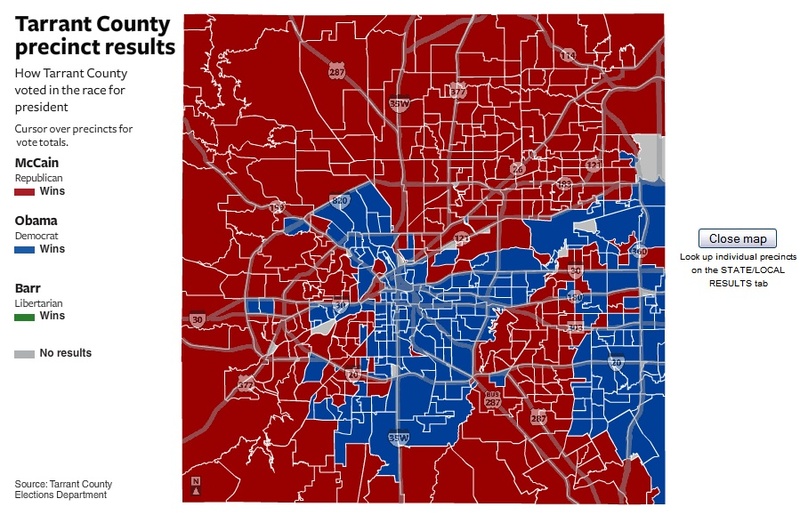 ^ "Tarrant county election results by precinct, 2008". ^ "U. S. Electoral College 2008 Certificate". www.archives.gov. Retrieved 2016-09-22.